Regular Season Series: First of five meetings this season. Tonight's Promotions: In honor of our 41st President George H. W. Bush (1924-2018), the Admirals are offering a special 41-percent discount on tickets for all active and retired military personnel with military ID. These discounted tickets must be purchased at the Scope Box Office. Each ID will be good for a discounted ticket for the ID holder and one guest. Offer Valid for tonight's game only. About Tonight's Game: Tonight's contest marks the first of three meetings this week at Scope between the two teams. The Admirals (12-7-1-1, 26 pts) are currently riding a four-game unbeaten streak (3-0-1-0) and enter tonight's game tied for second place in the South Division with the Florida Everblades. Both Norfolk and Florida are one-point back of the first place Jacksonville Icemen. The Everblades and Icemen play tonight in Estero, Florida. The Monarchs (8-9-1-1, 18 pts) will be looking to get back into the win column after dropping their last three contests. Manchester sits in seventh place in the North Division, but is just a mere four points back of third place. 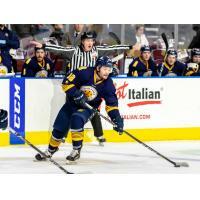 About the Admirals: Darik Angeli is coming off a productive week on the road. Angeli enters tonight's play having posted three consecutive multi-point games and finished the three-game road slate with six points (2g, 4a)....Forward Luke Nogard is currently riding a three-game goal scoring streak....Goaltender Ty Reichenbach ranks second in the league with 481 saves and is tied for third with nine wins. About the Monarchs: Spencer Watson leads the Monarchs with 10 goals and is tied for the team lead in points with Matt Marcinew (16 pts). Watson is currently riding a six-game point streak (5g, 4a)....Defenseman David Kolomatis is currently in his eighth season with the Monarchs. Kolomatis played four seasons with the AHL Monarchs from 2009-2013, and returned to Manchester in 2015 when the team joined the ECHL. A point producing defenseman, Kolomatis has accrued 239 points in 509 career games....The Monarchs are first in the league averaging 36.11 shots-per-game. Teddy Bear & Ticket Offer: Receive one red-level voucher for Saturday's game and an Admirals Teddy Bear to throw onto the ice for just $20! To purchase call 757-640-1212, or to order online. The Fur Circus is in town! The Fur Circus mascots will be on hand to entertain fans throughout the game! 2018-19 Ticket Packages are Currently on Sale! The Admirals offer flexible partial plans that will best fit your schedule and budget! To view pricing and benefits of all available ticket packages.